Samsung Electronics Co., Ltd. has announced the Galaxy Camera 2, the second iteration of its Android-powered dedicated point and shoot camera. The new camera features a new design that makes use of Samsung’s faux-leather material that we’ve seen on the Galaxy Note 3. 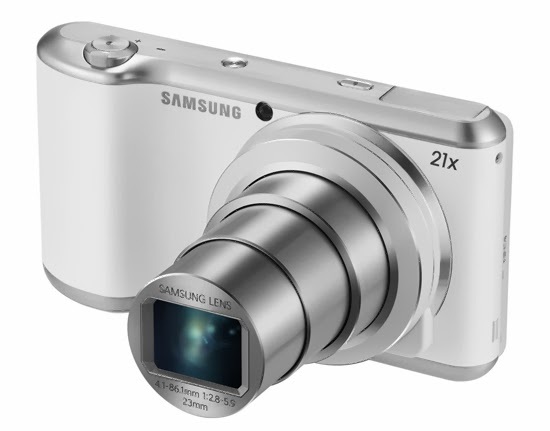 Galaxy Camera 2 sports 16-megapixel camera with 1/2.33-inch sensor size, Xenon flash, and 21x optical zoom. Samsung has also created a number of additions on the software aspect, namely new shooting modes that bring the total up to twenty-eight. As was the case on the first Galaxy Camera, skilled photographers are able to fine tune settings like ISO values et al. A number of specs are upgraded – the Galaxy Camera 2 sports a 1.6GHz quad-core processor, 2GB of RAM, 8GB of storage and a microSD slot, Wi-Fi, Bluetooth, and NFC connectivity, a 2000 mAh battery that may capture up to 350 photos on one charge, and android 4.3 jelly bean, though users will still be viewing photos on a 4.8-inch 720p display as they did with the first. If you like this article, please share it with your friends or comment below!